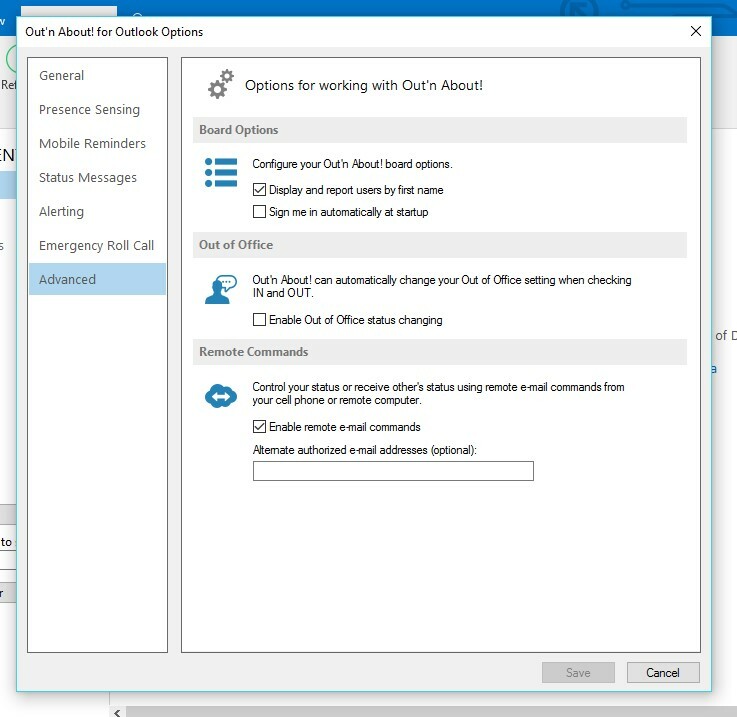 All of the Out’n About for Outlook configuration options are available in the Out’n About! 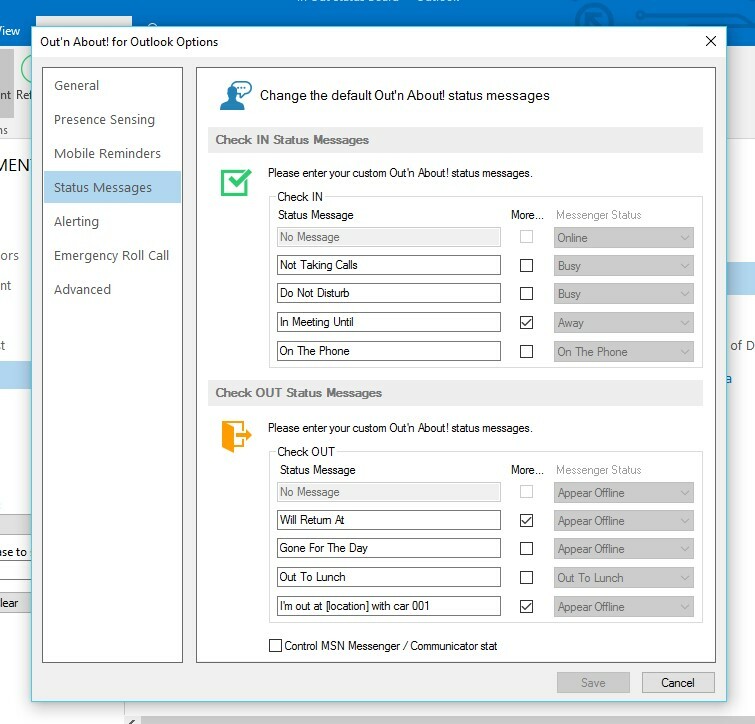 for Outlook Option menu. If you are using Outlook 2010 or above, click on the ribbon bar dialog launcher buttons at the bottom of each ribbon section. If you are using Out’n About version 4.0 and above, there is a dedicated Options panel button, inside the Out’n About! ribbon. The Out’n About! default status messages are fully configurable to allow the status message option you frequently use. If a status message requires further input, e.g. ‘In meeting until’, select the more information needed checkbox (…). Using this dialog you can set the In/Out Status Board refresh rate. The board will automatically be updated at this rate. 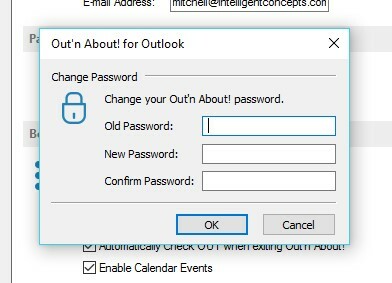 You can also set the board to automatically log out each time you shut down Outlook. 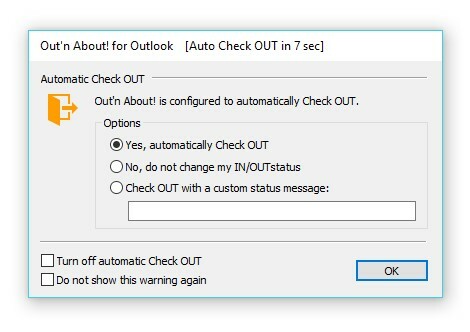 If you select the automatic checkout when you shutdown Outlook, the following dialog will be presented at shutdown. The system will automatically log you out if you do not respond to the dialog within 16 seconds. You can turn off automatic check out and/or tell the software to never present this warning again. 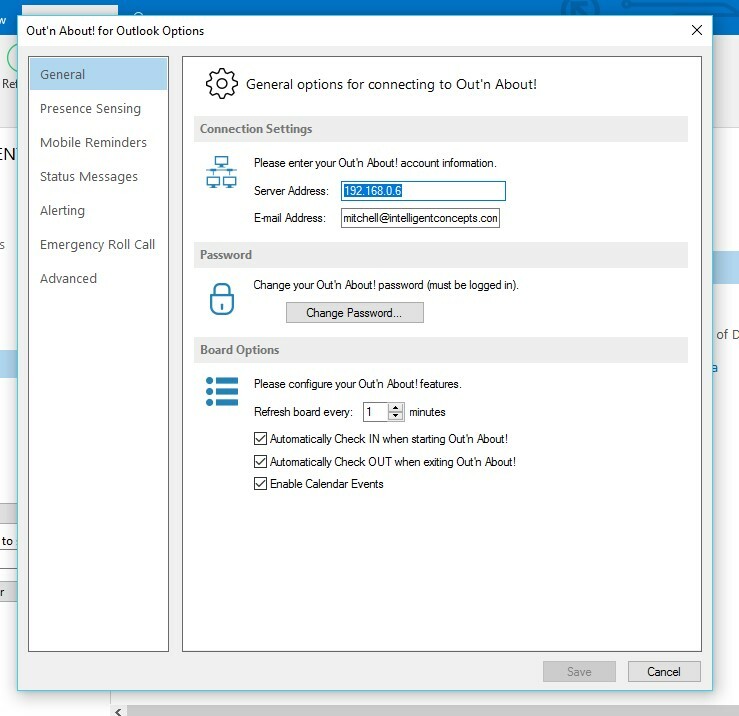 If you decide you want to show the dialog again after selecting the do not show option, simply turn off automatic check out, save the options, then turn it back on and this dialog will appear the next time Outlook is closed. The Advanced Option dialog allows you to control advanced features of the Out’n About! system. You can control your status or receive other’s status using remote email commands from your cell phone or remote computer. For additional information, you can learn more about Remote Commands. The Out’n About! 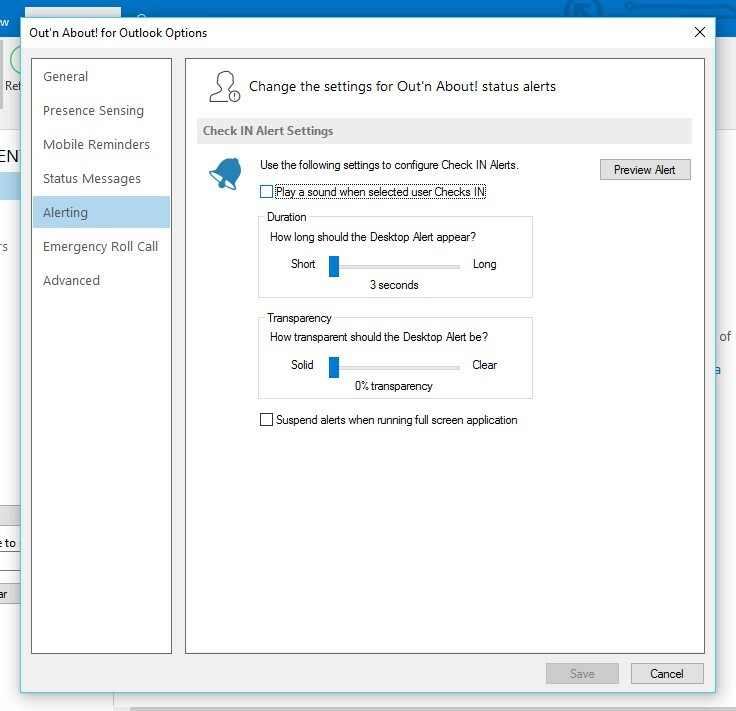 system contains a presence sensing features that can automatically set your status based on computer usage. 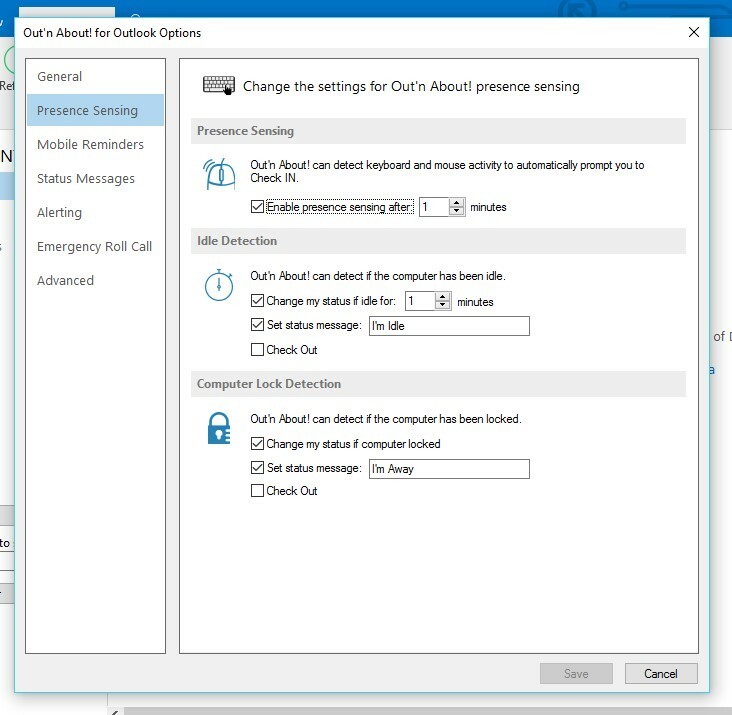 When the presence sensing option is turned on and you move your mouse or use your keyboard, the Out’n About! software will automatically prompt you to check in. If you are not ready to check in, you can snooze the presence sensing feature for a specified amount of time by pressing the snooze button. The Out’n About! 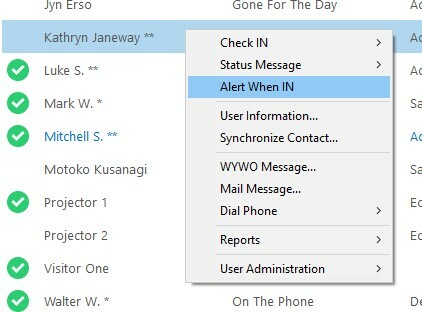 check in alert option allows you to request an alert when another employee checks in. This eliminates the need to constantly check the status board when you need to speak to another employee as soon as they are available. 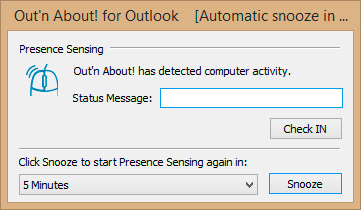 The Outlook Reminder and Out’n About! Check IN Alert windows are useless if you are not sitting in front of your computer. The Out’n About! Mobile Reminder feature solves this problem allowing you to automatically forward Outlook Reminders (appointments and tasks) and Out’n About! Check IN Alerts to your mobile phone, pager, or any e-mail address when you are away from your desk. When any of your Outlook Reminders popup, Mobile Reminders will wait for you to Snooze or Dismiss the reminder. 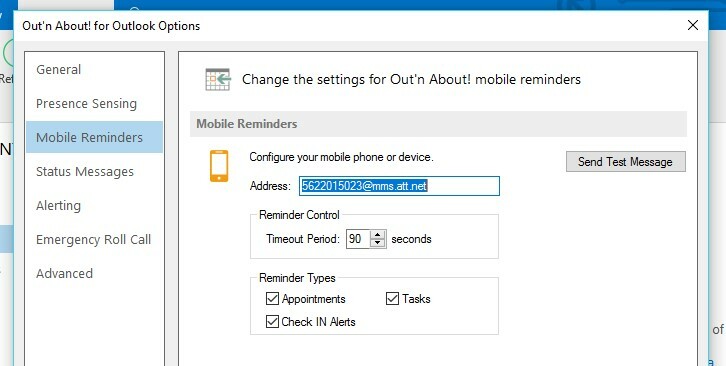 If you do not Snooze or Dismiss the reminder within the Mobile Reminders timeout period, the reminder will automatically be sent to the mobile device you have configured in the Out’n About! Mobile Reminders dialog. The same is true for any Out’n About! Check IN Alerts you may have configured.